The future of research on Japan. 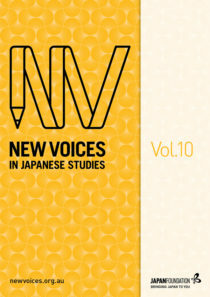 New Voices in Japanese Studies (formerly New Voices) is a peer-reviewed academic journal published by The Japan Foundation, Sydney. All contributors are emerging scholars, ranging from Honours graduates to PhD level, with a research interest in Japan. All papers are sole-authored and cover a range of subjects from the humanities and social sciences. Readers of New Voices in Japanese Studies are from a similarly broad range of academic backgrounds, united by a shared scholarly interest in Japan. To facilitate reading across the journal’s catalogue, care is taken during the editorial process to ensure that all articles are accessible to non-specialist readers. Contributions are welcome from emerging scholars with ties to Australia and New Zealand, which are under the regional remit of The Japan Foundation, Sydney. For details, see the Call for Papers page. Emerging researchers are increasingly conscious of the benefits of publishing early. At the same time, limited experience as well as competition within the publishing landscape means that emerging researchers can have difficulty finding a platform for their work. This is why New Voices in Japanese Studies was created. Early-career publishing stimulates feedback from peers and helps with benchmarking and sharing ideas. Importantly, it also creates a visible professional record which is invaluable for building both networks and careers. See our Editorial Vision for details on our mentoring approach, and see feedback from our authors for insight into the NVJS publishing experience. To our knowledge, New Voices in Japanese Studies is the only journal dedicated to publishing academic research by outstanding graduate-level scholars with a specific focus on Japan. New Voices in Japanese Studies is open access. We hope that you will continue to support the journal and its contributors by reading and sharing widely. Where possible, we invite you to share articles via links to the source page to help improve discoverability for other early-career authors. The Japan Foundation, Sydney is the Australian arm of The Japan Foundation, which was established by the Japanese government to promote cultural and intellectual exchange between Japan and other nations. It runs a diverse range of programs and events, including exhibitions, talk events, grant programs and Japanese language courses. The Japan Foundation, Sydney supports Japanese Studies at a tertiary level through grants, fellowships, newsletters, public speaking opportunities for researchers, and publishing New Voices in Japanese Studies.